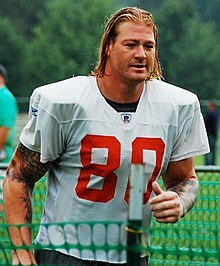 Jeremy Charles Shockey (born August 18, 1980) is a former American football tight end. He was drafted by the New York Giants 14th overall in the 2002 NFL Draft. He played college football at the University of Miami. The winner of the first-ever Diet Pepsi NFL Rookie of the Year Award in 2002, Shockey earned four Pro Bowl selections in his career and received Super Bowl rings with the Giants in Super Bowl XLII and with the Saints in Super Bowl XLIV. Shockey was interviewed about his time at the University of Miami for the documentary The U, which premiered December 12, 2009 on ESPN. As well as The U part 2. After Shockey's season-ending injury, the Giants went on to win the NFC title and beat the previously undefeated New England Patriots in Super Bowl XLII. The Giants' success even without Shockey sparked immediate speculation that the team would be better without the often vocal and increasingly injured tight end. Shockey declined to participate in several Giants team celebrations, including a White House tribute for the new Super Bowl champions and the team's blue carpet ring ceremony. Rumors surfaced before the 2008 NFL Draft that the Giants were looking to trade Shockey. On July 21, 2008, the Giants agreed to trade Shockey to the New Orleans Saints in exchange for second and fifth-round picks in the 2009 NFL Draft. He attempted to start the relationship with his new team on a good note, telling the Associated Press shortly after that trade, "The Saints have a lot of weapons, starting with Drew Brees, and I look forward to joining my teammates at training camp. This will be a fun year." In his first game against the Tampa Bay Buccaneers, he had 6 receptions for 54 yards. After three games with the Saints, Shockey had a sports hernia and sat for 5 weeks. Shockey was a minor factor for the Saints during the 2008 NFL Season, in which he caught 50 passes for a career low 483 yards and a career low 0 touchdowns. In 2009, Shockey became an important offensive weapon for the Saints, catching 48 passes for 569 yards and averaging close to 12 yards per reception. Throughout the season, Shockey was again plagued with injuries. Despite an injured knee, Shockey caught a pass for a touchdown in the Saints' playoff victory over the Arizona Cardinals. In Super Bowl XLIV, Shockey caught the go-ahead touchdown pass from Drew Brees. Shockey got his second championship title as the Saints won their first Super Bowl in franchise history by defeating the Indianapolis Colts 31–17. While playing for the Giants, Shockey lived in West New York, New Jersey, across the Hudson River from Midtown Manhattan. While playing for the New Orleans Saints, Shockey spent his off-seasons living in Miami Beach, Florida. In January 2013, Shockey filed for divorce after being married eight months to Daniela Cortazar-Shockey in Miami claiming the marriage was "irretrievably broken." A year later, New York magazine reported that he had mocked then-Dallas Cowboys coach Bill Parcells as a "homo," a comment he later denied making. A New York Giants team spokesman later claimed Shockey had been quoting a friend. ^ "Player Bio: Jeremy Shockey". Miami Hurricanes football. Archived from the original on May 21, 2007. ^ Schwartz, Paul (July 22, 2008). "Giants Put Shockey in Rear-view Mirror". New York Post. Retrieved May 23, 2017. ^ a b Glazer, Jay (July 21, 2008). "Giants reach deal to send Shockey to Saints". FOX Sports. Archived from the original on August 2, 2008. Retrieved September 7, 2008. ^ "Carolina Panthers 2016 Statistics". ESPN.com. Retrieved May 23, 2017. ^ "Eleven Panthers become free agents". Carolina Panthers. May 13, 2012. Archived from the original on September 15, 2012. Retrieved May 23, 2017. ^ Lynn Zinser (August 2, 2005). "Shockey's Tattoo: Red, White, Big Blue". New York Times. ^ "Tale of My Tattoo". CNNSI.com. October 10, 2005. ^ Price, S.L. "The Revenge Of Jeremy Shockey: Or, how a fatherless boy from Oklahoma poured his rage into football, stuck it to doubting coaches, made himself into the most explosive young player in the NFL and became the toast of New York ", Sports Illustrated, July 28, 2003. Accessed June 12, 2012. "Derek Jeter might have toned down his nightclubbing this summer, but Shockey, working out of his West New York, N.J., condo overlooking the Hudson River, has picked up the slack. " ^ "Files for Divorce After 8 Months". TMZ.com. Retrieved January 6, 2013. ^ "From 2002: Jeremy Shockey's gay problem". Outsports. February 20, 2013. Retrieved May 23, 2017. ^ Vacchiano, Ralph (September 27, 2002). "Shockey Makes a Stern Apology Sorry for Gay Slurs on Radio". NY Daily News. Retrieved May 23, 2017. ^ "Shockey calls Parcells 'homo' in magazine interview". ESPN.com. August 8, 2003. Retrieved May 23, 2017.